Just six weeks after the inception for this new feature, our directory of community groups and activities is now live on the Council’s website. The need for this feature was identified by staff and partners who faced problems when trying to access information on community groups in order to assist end-users. There was no single place for information and often the data available was found to be out of date or of unknown ownership. 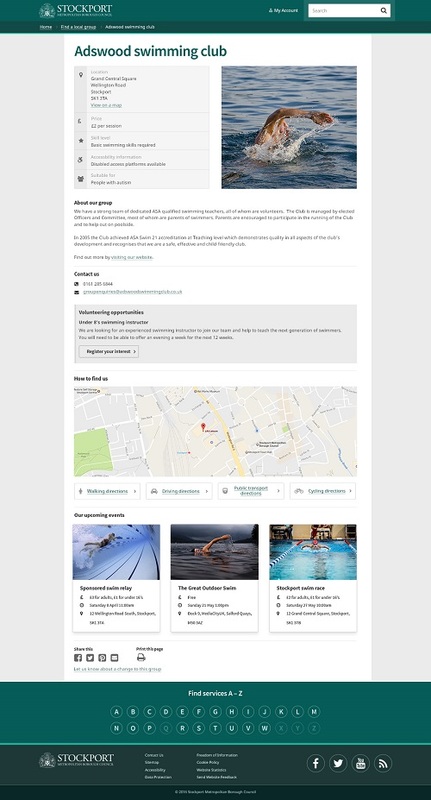 Although the push to create this feature in the first instance was for our staff and partners, we decided to make it available on the website for use by all the residents and businesses of Stockport. 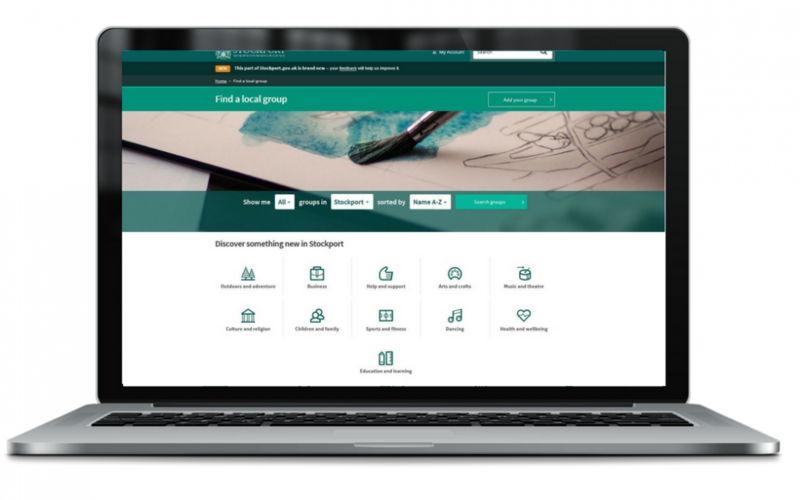 Stockport Council is committed to finding new ways for communities to come together and grow stronger and this feature makes it easier for everyone to find out about groups and activities and enhances the informational content of our new website. Each group’s page includes basic information about the group, contact details and location map and options for sharing via social media and email. There is also an area where users can volunteer to help with the group. We have made it easy for community organisations, council services, partners and businesses to add their own information to our groups listing. 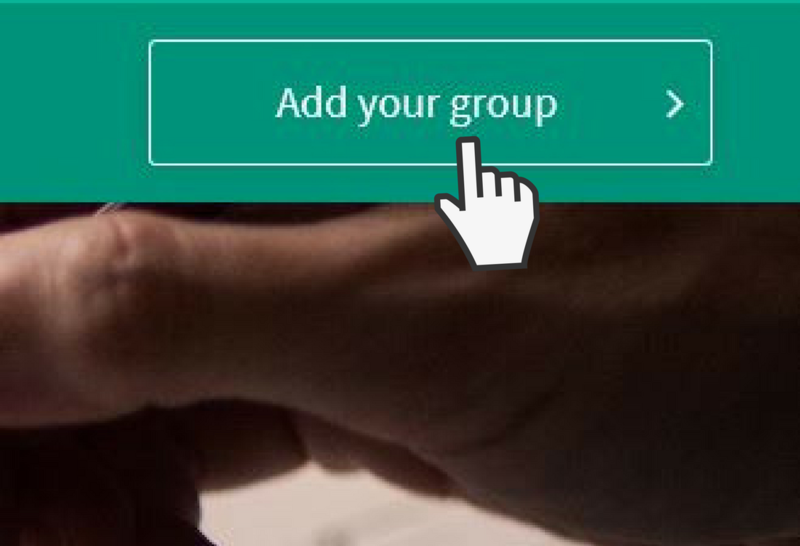 To add a group to the listing users follow the ‘Add your group’ link on the home page and the online form prompts them to provide all the necessary information. Currently over 650 groups are promoted but this number is expected to rise as we issue wider communications to the general public. The Groups directory has been built from the capabilities developed for the Events calendar. This has made it much quicker to build than if we had started from scratch on this feature. We are now developing an administrative system for group owners to manage their own content ensuring that listings will be kept up-to-date at all times. Over the coming months we will be extending the directory, integrating events with the group listings and adding an even wider range of services. We hope that ultimately our directory will allow users to confidently find, book and pay for a wide range of community services, whether these are provided by the Council, our Partners or the voluntary sector.